Texas Holdem and Omaha Holdem are two of the most popular variations of poker played both online and offline. Both games share a fairly similar structure, where players are required to use community cards along with their own cards to make the best 5-card hand. However, despite the similarities in structure, the games require different strategies and playing styles to be able to come out on top. So how to the games of Holdem and Omaha Hi compare? Which game is most popular? 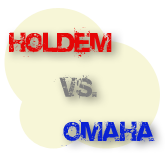 Holdem is by far the more popular game, with a substantial number of players favouring it over Omaha in card rooms and online. It is common for a new poker player to take up the game of Texas Holdem due to its boost in popularity over recent years, possibly after a few months of play dabble in a few games of Omaha. Nevertheless, the vast majority of players will stick to the game they know best, and continue to play Holdem without taking the time to learn how to play Omaha profitably. The different playing styles of the two games. Both of the games have completely differing playing styles. Holdem is a fast paced game focused around pushing edges and getting into the minds of your opponents. Whilst in Omaha it is also beneficial to get inside the mind of your opponent, the game is more centred around mathematics, and playing consistently to take advantage of spots where the odds are more heavily in your favour. The starting hand requirements in Holdem and Omaha also vary. Typically in Holdem, you want to start with the big cards that are going to make high pairs or better. However, it is perfectly acceptable to play with smaller connecting cards in an attempt to catch your opponent out and make a deceptively strong hand. In Omaha however, there is no room to play with low connecting cards to try and deceive your opponents. In Omaha, you either have the best hand or you don’t. Because each player is holding 4 cards, it is more likely that one player is holding the complete nuts at one particular stage in the hand. Therefore, it is pretty useless to try and play with low cards in an attempt to deceive your opponent, as they are always prepared to be facing a very strong hand regardless of how raggy your hand may be looking at the start. In other words, you have far less implied odds in Omaha by calling to see a flop with a sub-standard hand, because opponents are not going to call because they fail to put you on a strong hand. How does the action of the two games compare? Because of the fact that you are able to profitably play a wider range of hands in Holdem than in Omaha, it makes Holdem a much more action orientated game for the player. For most, this is exactly what they are looking for when they sit down at the poker table, as sitting back and waiting hand after hand just to enter a pot is not going to be everyone’s cup of tea. On the other hand, it does mean that there is less variance involved in Omaha, as you are playing fewer hands and working with bigger edges. Which game is most profitable? In a nutshell, I will say that Hold'em in general is a more profitable game than Omaha. Both Omaha and Holdem can be played profitably, but with fewer people playing Omaha, you have to have a high level of ability to be able to outplay other opponents and make money. In Holdem, there are literally thousands of people playing online at one time, and so you naturally have a great range of playing abilities. In Omaha however, you normally have two groups of players; the novices trying out Omaha for fun, and the veterans that know the game like the back of their hand. Therefore whereas in Holdem you can manage to make a decent amount of money with an intermediate ability at the tables, in Omaha you have to have a greater ability to compete with the veterans of the game whilst taking money from the novices. For most, Holdem is the game that is preferred because of the smaller amount of time it will take to be able to reach a consistent winning style of play. However, there is a lot of money to be made from Omaha if you know how. That’s why some of the biggest cash game players in the world regularly play Omaha. Texas Hold'em vs Omaha overview. So which game is better? In my opinion it is unfair to say that one or the other is better, as they both have their unique plus points. Some players prefer Omaha, some prefer Holdem. The popularity of Holdem in the media over recent years has done a lot to boost the overall popularity of the game in casinos and online, which has left Omaha in its wake. The pick-up and play nature of Holdem is always going to give it the advantage over Omaha. But at the end of the day, there is always going to be room for Omaha at the tables. But what would I say? Hold'em every time.